Each month as part of this series from the AAS Historical Astronomy Division, an important discovery or memorable event in the history of astronomy will be highlighted. This month, guest author Christopher Corbally of the Vatican Observatory focuses on the birth of Angelo Secchi and the pioneering of astrophysical spectroscopy. The years 1860 and 1861 were highly significant for astronomy. Five people, by their spectroscopic contributions, founded the physics of stars: astrophysics. The first was Gustav Kirchhoff, who interpreted the dark lines that Joseph von Fraunhofer had seen in the spectrum of the Sun many years earlier in terms of the glowing chemical gases that Kirchhoff had produced in his laboratory. His work stimulated observations of other stellar spectra by Giovanni Battista Donati in Florence, William Huggins in London, Lewis Morris Rutherfurd in New York, and Angelo Secchi in Rome. 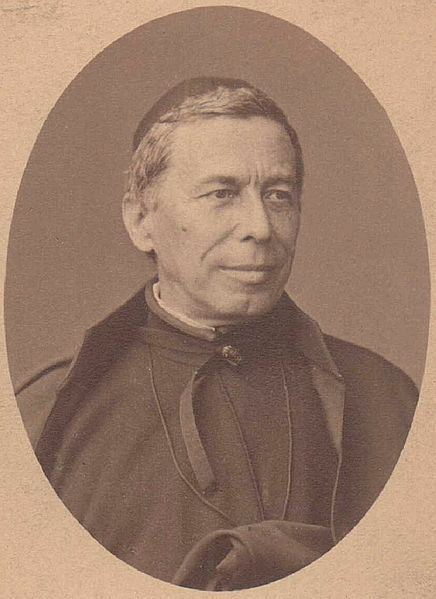 Of these pioneers we highlight Father Secchi, who was born 200 years ago, on 28 June 1818 (50 years and a day earlier than George Ellery Hale). Secchi's parents encouraged his quick mind with a Jesuit education in his hometown, Reggio Emilia, in North Italy. This led, at the age of 15, to his joining the Jesuit novitiate in Rome, where he specialized in science and mathematics. He later taught these subjects in Loreto before beginning the theological studies that led to his priestly ordination in 1847. In early 1848 the Roman Revolution drove Jesuits from the city. Both Secchi and Benedetto Sestini, SJ, who was an experienced astronomer, left for Georgetown College (now Georgetown University) in Washington, DC, though Secchi en route spent six months at the Jesuit-run Stonyhurst College in Lancashire. Secchi’s arrival at Georgetown in November 1848 was perfectly timed: Natural sciences were receiving more emphasis there just as Secchi’s own interests were expanding. James Curley, SJ, had recently built the Georgetown College Observatory. Secchi’s close friendship with the celebrated oceanographer and meteorologist, Matthew Fontaine Maury, fostered his skills in these disciplines too, while he in turn later brought Maury’s discoveries to the attention of Italian scientists. So when, in September 1849, Secchi was able to begin his return to Italy, again traveling via England, he had gained international experiences that would prove most relevant for taking up his new appointment in the Roman College as director of the observatory. He held that directorship, along with a teaching professorship, from 1850 until his death in 1878. Once back in Rome, Secchi made haste to improve the telescopes, instrumentation, and location of the observatory. In science, technical improvements along with inventive minds lead to significant discoveries. Although photography was still insufficiently sensitive to capture stars, Secchi’s sharp eye at the telescope allowed him to make contributions to many areas of astronomy. In the solar system he found a comet, drew a detailed map of the lunar crater Copernicus, and produced the first color illustrations of Mars, including its “canali,” as he called the channels in Italian. For the Sun he discovered solar spicules, showed its coronal prominences to be real physical features, and recorded sunspot activity. His measurements of double stars revised Struve’s famous catalogue. But Secchi is mentioned in astronomy textbooks for one of his main achievements, the pioneering of astrophysical spectroscopy with which we began this account. Secchi’s dedicated reproduction of the spectra of some 4,000 stars, observed between various duties as a director and a Jesuit, and only when clear skies graced Rome and no significant Moon prevailed, is amazing. The analysis of these spectra enabled him to sort them into a limited number of distinct types and to recognize, following Kirchhoff, that chemicals we know on Earth are also found in stars. That achievement, along with his broad services to meteorology, limnology, geodesy, and earthquake damage mitigation, are well worth celebrating during this bicentenary of Secchi’s birth. Secchi’s hand-drawn spectra in La Soleil illustrating his Type III, current M-type stars (Fig. 1) and Type IV, current carbon stars (Figs. 2 & 3). Below each spectrum is Secchi’s curve for its variation in light intensity. 2. Hearnshaw, John B. 1986. 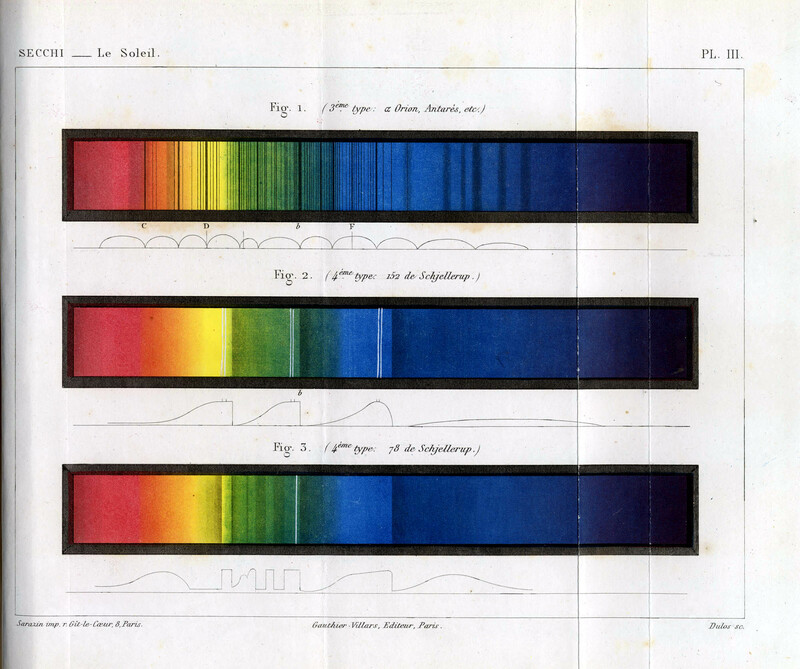 The Analysis of Starlight: One Hundred and Fifty Years of Astronomical Spectroscopy. Cambridge University Press. 3. Maffeo, Sabino. 1991. In the Service of Nine Popes: 100 Years of the Vatican Observatory. Trans. George Coyne, SJ, Specola Vaticana.